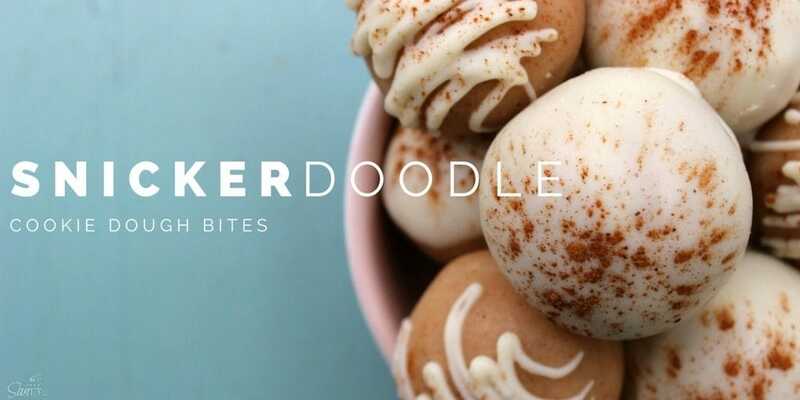 These Snickerdoodle Cookie Dough Bites are literally the most amazing cookie dough you will ever eat, ever! And what makes these Snickerdoodle Cookie Dough Bites so special is the secret ingredient…caramel! Oh, yes there is caramel. In a medium-sized bowl, shift together sugar, flour, salt and cinnamon. Beat in butter, vanilla extract, caramel and milk until it starts to come together and is creamy & smooth. Scoop a heaping tablespoon, I actually use a cookie dough scooper, makes the job easy! Pack in the dough then remove from the scooper or tablespoon and place on prepared pan, you can also roll them into balls which I did for the batch pictured. Place pan in the refrigerator to chill, approximately 10 minutes. While the dough is chilling, melt chocolate according to package directions. I heat in 30 second intervals, until chocolate is completely melted. Ziploc bag with the corner snipped off, topped off with a pinch of cinnamon. Once the bites are drizzled, covered or dipped in chocolate, finish them off with a dust of cinnamon allow chocolate to harden. Now they are ready to enjoy! To store the Snickerdoodle Dough Bites place in an airtight container in the refrigerator for up to 5 days. 0 Response to "Snickerdoodle Cookie Dough Bites"